Every now and then, I get the same question from many nopCommerce users in regards to adding a new custom page is nopCommerce. 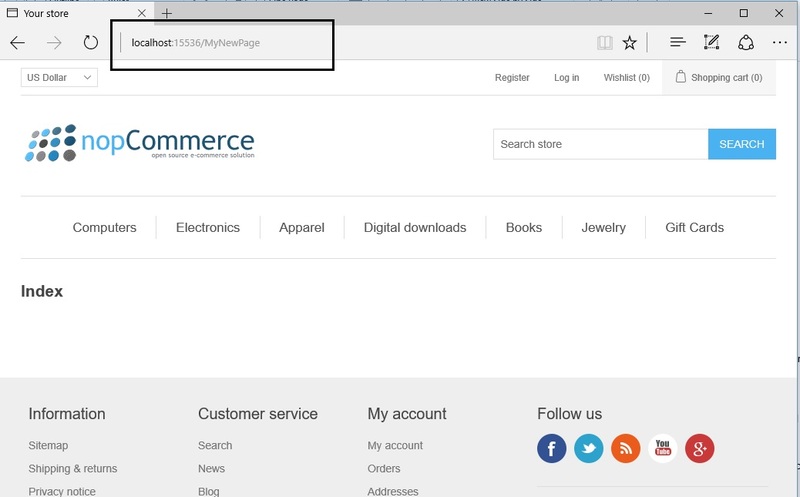 nopCommerce switched from Web Forms to MVC in version 2.X and everything was rewritten from scratch along with the architecture improvements. 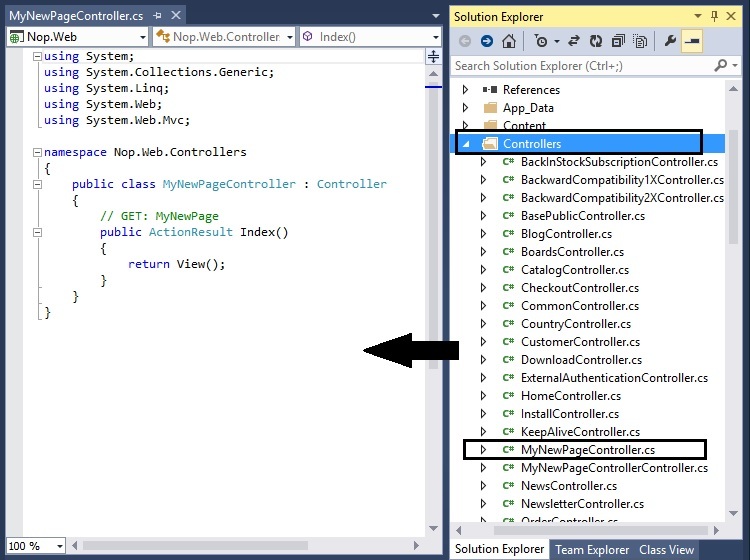 While ASP.NET MVC tends to get the most attention these days, many ASP.NET developers are still new to MVC, as it can be a learning curve for any .NET developer. So, I completely understand that it can be quite overwhelming to work with something that is totally different from Web Forms. 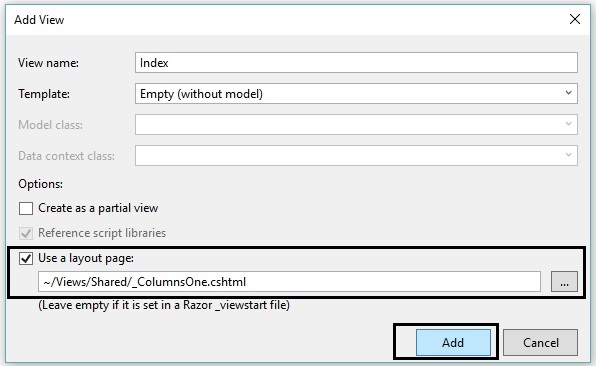 Web Form’s ASCX can be considered a VIEW in MVC. Web Form’s ASCX.CS can be considered as a CONTROLLER in MVC. Web Form’s ASCX.DESIGNER.CS can be considered as a MODEL in MVC. What Do You Need to Add a Custom Page in nopCommerce? Note: In this article we will be using the latest version of nopCommerce (i.e. nopCommerce 3.70). Before we go further, you need to understand how custom pages are different from topic (pages). 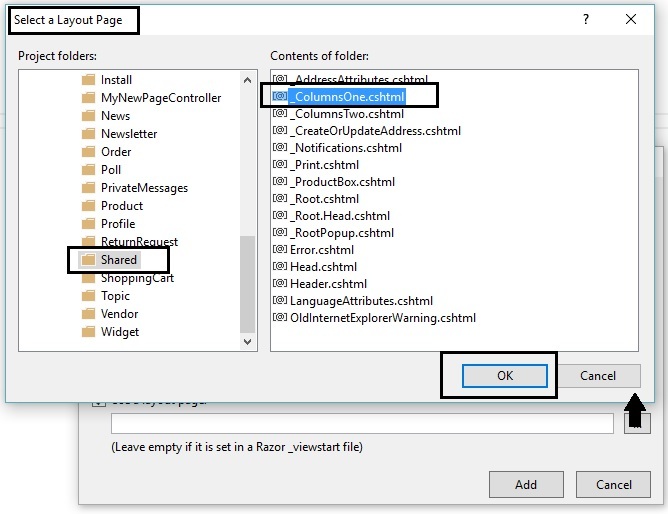 Topics (pages) are free form content blocks that can be displayed on your site, either embedded within other pages, or on a page of their own. These are often used for FAQ pages, policy pages, special instructions, and so on. 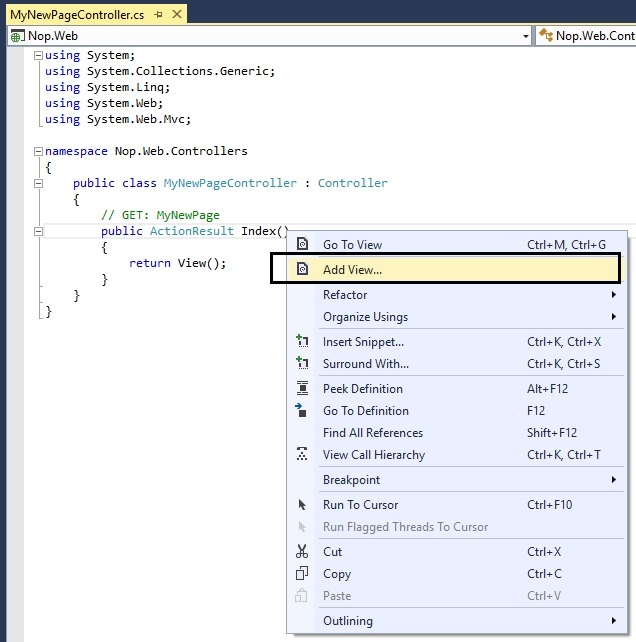 On the other hand, custom pages gives you a full control over the functionality of the page. 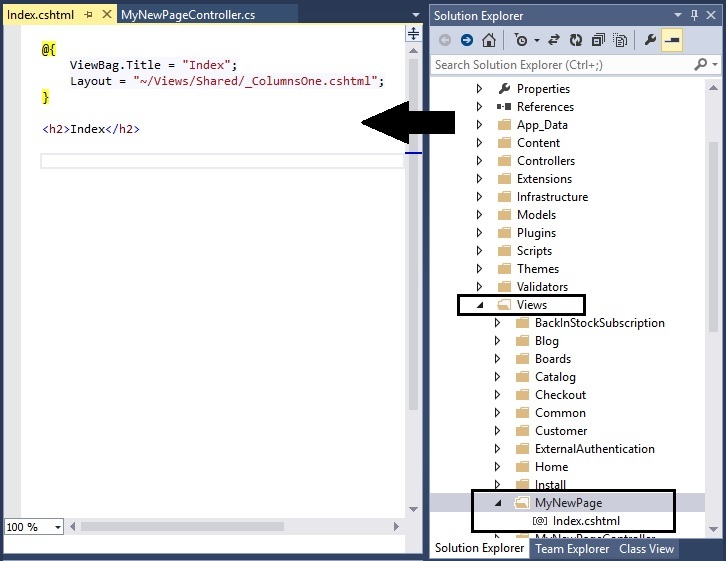 A topic (page) can be embedded within your custom page but you can’t embed a custom page into a topic page. 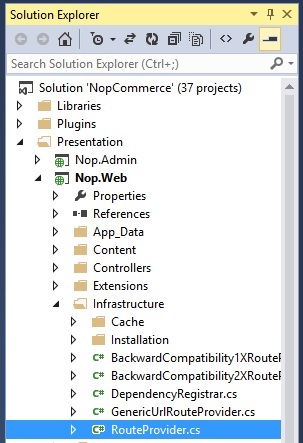 I would like to point out one important thing here that if you are adding/creating a new custom page in your project/solution, and if you plan to upgrade your nopCommerce version, you will have to add the custom page once again in your updated solution. 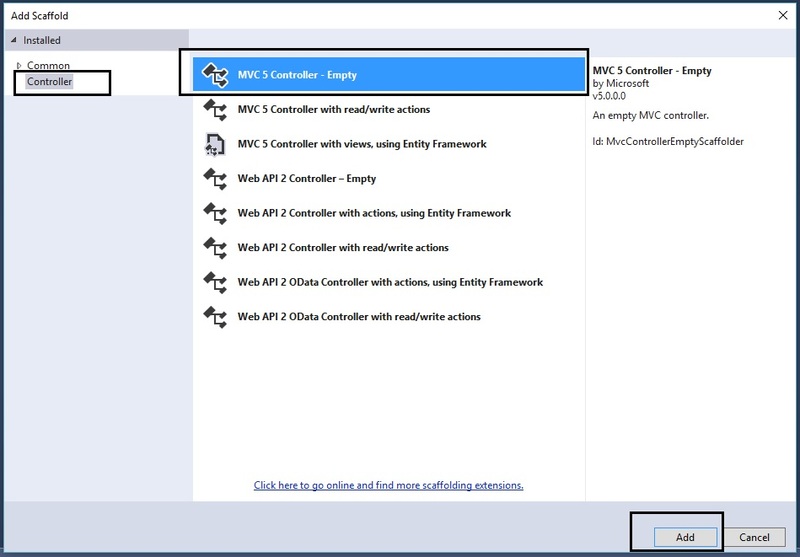 Step 2) Now, right click the "Controllers" folder > Select "Add" > Select "Controller.."
What Are Controllers in ASP.NET MVC? 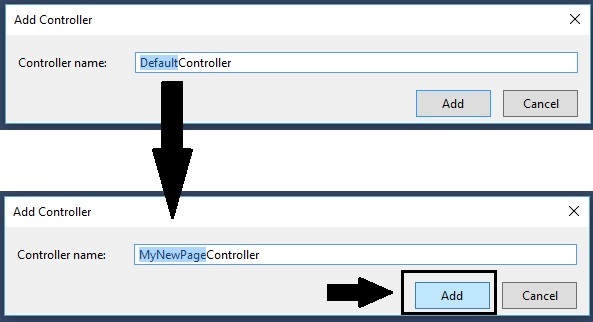 Steps to add a new custom page in nopCommerce (ASP.NET MVC based e-Commerce solution) Step 3) In the add scaffold window, select the "MVC 5 Controller – Empty" and click "Add"
Step 4) Name the controller: I am naming it by changing the controller name from "DefaultController" to "MyNewPageController"
Step 6) On the left side (code): Right click on the Public ActionResult Index( ) line and select "Add View..."
What Are Views in ASP.NET MVC? 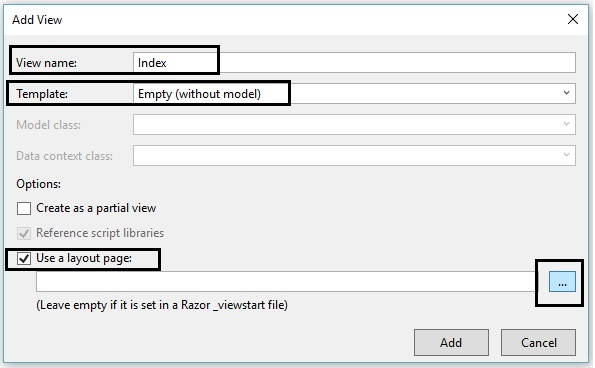 Step 7) Leave the view name as "Index"
The only box on this window that should be checked will be "Use a layout page:"
Select the layout page by clicking the [...] button. I am selecting "_ColumnsOne.cshtml" in this case (and press OK). 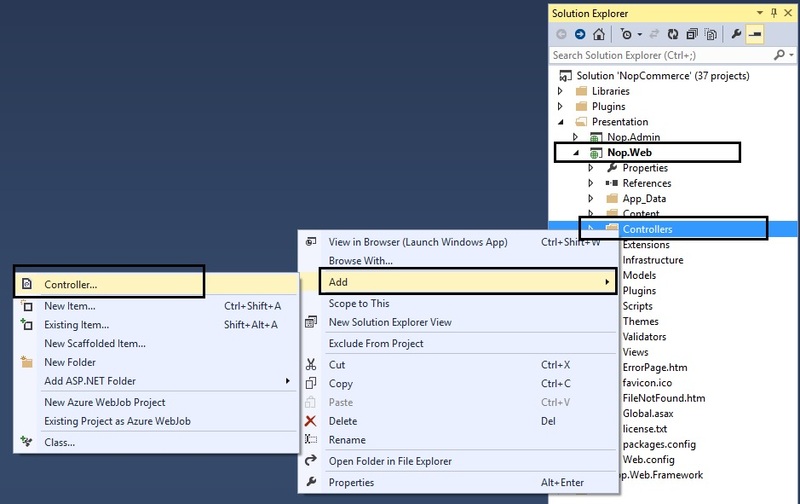 After selecting your layout page, click on the "Add" button. Step 8) Now, you will get a "Index.cshtml" page. 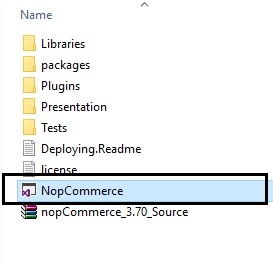 Steps to add a new custom page in nopCommerce (ASP.NET MVC based e-Commerce solution) Routing in nopCommerce nopCommerce is based on ASP.NET (MVC) and it follows the IRouteProvider interface for registering the routes during the application start event. All the routes are registered in the "Route Provider" class in the Nop.Web project. (In my case, I will change the URL to: http://localhost:15536/MyNewPage) You should see a page with the layout that you chose and in the content it should say "Index"